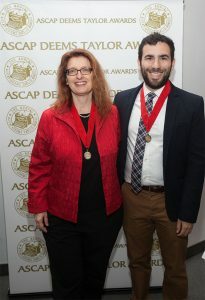 UNC-Chapel Hill’s Will Robin and Annegret Fauser were honorees at the 46th annual ASCAP Foundation Deems Taylor/ Virgil Thomson Awards ceremony. Will Robin, a doctoral student in musicology at UNC-Chapel Hill, was among the honorees at the recent 46th annual ASCAP Foundation Deems Taylor/ Virgil Thomson Awards ceremony. Robin received an award for his 2013 article titled “Shape Notes, Billings, and American Modernisms,” which examined the influence of Revolutionary-era Yankee hymns and Southern folk traditions on American concert music. He chronicled a variety of works of 20th- and 21st-century composers such as Aaron Copland and Virgil Thomson, who drew on American sacred music traditions. Robin’s article was published by NewMusicBox.org, a publication of New Music USA. Robin and the other winners for outstanding print, broadcast and new media coverage of music were formally recognized at a special invitation-only ceremony and reception in Manhattan on Nov. 12. Annegret Fauser, Cary C. Boshamer Distinguished Professor of Music and an adjunct professor of women’s and gender studies at UNC-Chapel Hill, was honored for her book, Sounds of War: Music in the United States during World War II, published by Oxford University Press. Robin is a member of the Royster Society of Fellows, which is The Graduate School’s select interdisciplinary fellowship program. A critic, scholar and performer, Robin currently serves as the North Carolina Symphony’s inaugural Scholar-in-Residence. Founded in 1975, The ASCAP Foundation is a charitable organization dedicated to supporting American music creators and encouraging their development through music education and talent development programs.